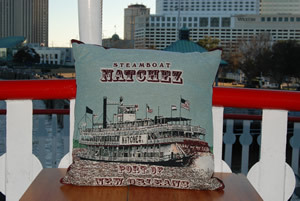 The Steamboat NATCHEZ Gift Shop offers a wide variety of items for steamboat enthusiasts. Many more items are available on board. At this time only Gift Certificates can be purchased directly from this site through PayPal. All items include applicable shipping and taxes. Oversees shipping not available at this time. 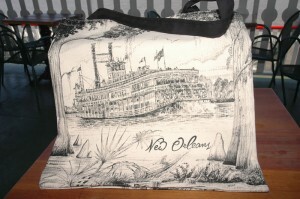 Consider riverboat gifts for locals...and those who wish they were. 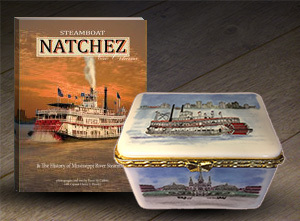 Steamboat NATCHEZ and the History of Mississippi Riverboats and the New Orleans Icon Keepsake box. Whether it is a harbor jazz cruise or a get-a-way dinner jazz cruise, a gift certificate for the Steamboat NATCHEZ is a great way to celebrate. Be sure to let us know if it is a special occasion, you want a special message to the recipient, or need it mailed to another address. Please allow a minimum of 48 hours processing (business days). Recipient can make their own reservation for the cruise date of their choice. The dollar value does not expire. 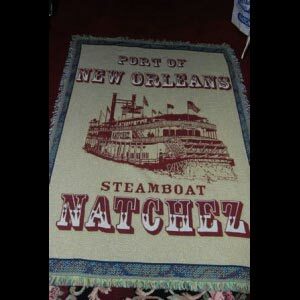 The only true steam-powered on the Mississippi today, the Natchez is a memorial to the voluptuous curves and ornamentation of an earlier day. 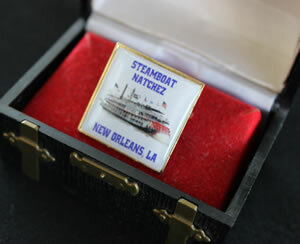 Relish the details of the steamers that preceded her and the impact on the history of our country and the New Orleans port. 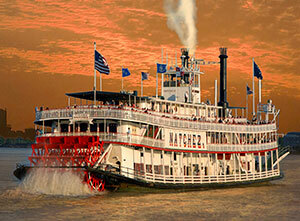 The current NATCHEZ IX is an honest sixteen miles-per-hour boat continuing that grand tradition. 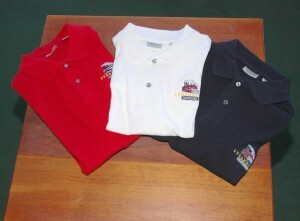 Golf shirt in cotton pique. 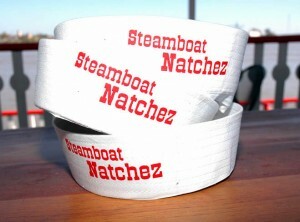 Embroidered NATCHEZ logo. 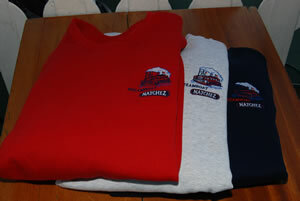 Colors – Red, Navy, White. 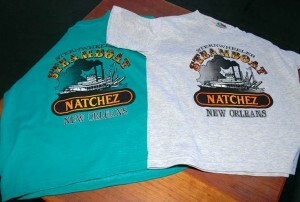 Crew sweatshirt with NATCHEZ logo on left breast. Colors – Red, Navy, Ash. 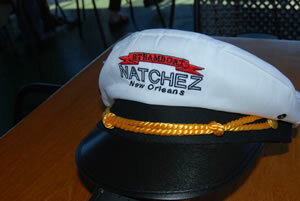 One of a kind, authentic NATCHEZ hat/lapel pin. Size of a quarter. 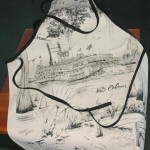 This apron's design is done in charcoal. It would make a unique addition to your kitchen. 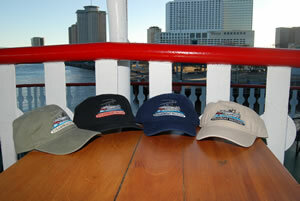 Deluxe baseball caps with a relaxed fit and embroidered NATCHEZ logo.Colors – Green, Black, Navy, Khaki. White Captain's hat with black bill. 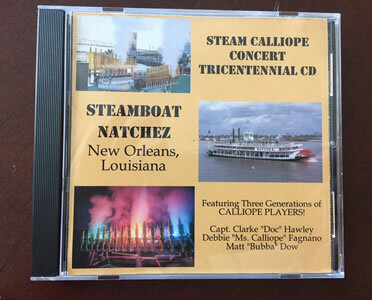 Featuring three generations of Calliope players, this CD was recorded live on the Steamboat NATCHEZ in New Orleans in 2017. Players include Capt. Clarke "Doc" Hawley, original Master of the Steamboat NATCHEZ, Debbie "Ms. Calliope" Fagnano the talented staff musician, and Matt "Bubba" Dow a third generation river man who began his calliope career in 2007. 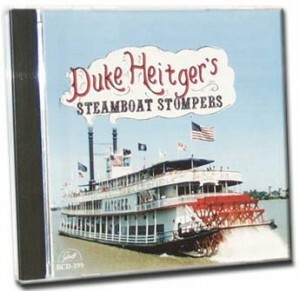 Song titles showcase tunes such as: Way Down Yonder in New Orleans; Calliope Rag; Louisiana Fairytale; and many more. 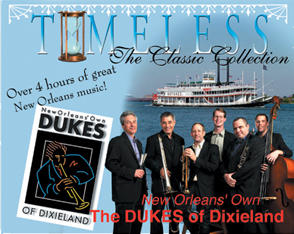 Dukes of Dixieland's "Timeless" The Classic Collection 4CD set.